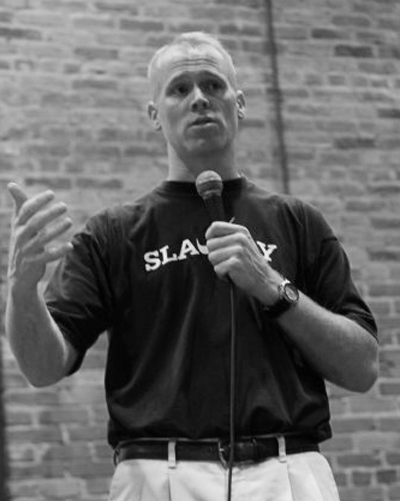 Jim Keady, theologian, activist, educator, and elected official, is the founding director of Educating for Justice, Inc. Jim has spoken across the United States and at international venues to thousands of interested audience members. He has been sought out by members of the U.S. Congress, as well various university administrators, religious and union leaders and student groups to offer his personal and professional experience and critiques on the issues of sweatshops, globalization and social justice. Jim holds a masters degree with distinction in theology from St. John’s University (NYC) where he concentrated his studies in social ethics and pastoral theology. Along with studying theology, Jim also coached with St. John’s Men’s Soccer team, at the time, the NCAA Division One National Champions. He was eventually forced to resign from his job because he refused to wear and promote Nike’s products as part of the school’s $3.5 million dollar endorsement deal with the sportswear giant. Prior to his work with EFJ, Jim taught high school religion for five years at schools in New York and New Jersey. He also played and coached soccer at the youth, high school, college and professional levels. Along with his graduate degree from St. John’s, he holds a Bachelor of Science degree in Psychology from St. Joseph’s University. He has spent time traveling the globe and doing volunteer work in Asia and Europe with Mother Teresa’s Missionaries of Charity. In 2001, the Mario Savio Foundation (CA) recognized and honored Jim’s work for justice, naming him the “Young Activist of the Year.” Jim is currently producing a feature length independent documentary film and writing a book, both titled, SWEAT, which will detail his decade-long work of advocacy on behalf of Nike’s overseas workers. Jim has also been involved in electoral politics and from 2005-2008 served as a Councilman in the City of Asbury Park, NJ. Jim currently lives at the beach in NJ with his daughter, Reese. When not doing his social justice work, he enjoys being a Dad, coaching and playing soccer, bodysurfing, playing basketball, reading, and bike rides on the boardwalk.